There are no pit or raku firings from November through March. Firings will commence in April, weather permitting. They begin at 11 am and end at 6 pm. August 14th, Pit firing, 11:00, $5 per piece fee. Firing Friday is exciting and fun. Join us for a pit firing at Northeast Ceramic Supply and Monroe ClayWorks. Everyone is invited to come, bring a bisque fired piece (no larger than 12″ x 12″) and the cost is just $5 per piece. We’ll have all the firing materials. Monroe ClayWorks members can fire 3 pieces for free. Each additional piece is $5. 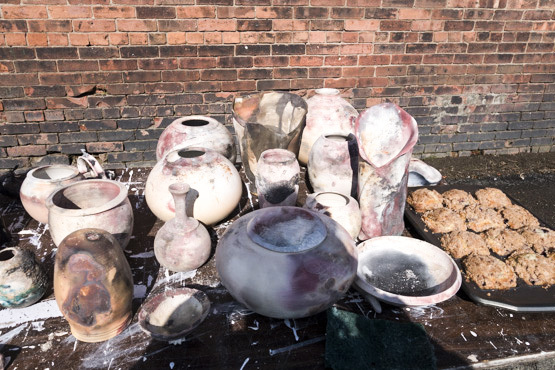 Pit firing or sawdust firing is not a true firing because pots do not reach sintering temperature and need to have been bisque fired before being placed in the pit. Pit firing will give a range of blacks, browns and tan colors. These colors can be enhanced with the use of oxides, copper wire, banana peels, coffee grounds, seaweed and other organic materials. The effects of the pit firing are also determined by the color and porosity of the clay body. In a loosely stacked brick enclosure approximately six inches of sawdust is placed, then the pots and organic material is put around the pots. All pots and organic materials are covered with more sawdust. On top of the sawdust is placed a layer of crumpled newspaper. The newspaper is lit in several places and when the flames have died out and the sawdust has started to smolder the pit is covered with sheet metal and left for at least twelve hours. Twenty-four hours later the pit is opened and the pots are carefully removed. The pots are washed, scrubbed if necessary. When the pots are dry they are waxed. Pit fire wares are for decorative use only and are not to be used to hold food or water.